It is Sunday and I awaken to reality. I rarely meet forensic psychologists but I have met one in my two weeks here and he lives just across the park from where I am staying. He is my first port of call in search of assistance – a silver thread across the park. Breakfast is immediately on and support is underway: letters to contacts in legal aid, and to journalist friends, and the drafting of a statement on my behalf. What would I do without him? – No one here to support me, no knowledge of the system, and only a few minutes before my court appearance to talk to whatever stranger happens to be at legal aid before my hearing. But this is also good – I am getting some first-hand experience of how it is for the Australian Aboriginal people of Alice Springs – the majority of whom, I am told, have been through the prison system – very clearly through no fault of their own. According to one ABC report titled “Indigenous Prison Rates are a National Shame” in 20 years, the rate of one in seven people incarcerated being Aboriginal has increased to one in four. And, as an artist, I have the opportunity to share this with you in the glowing clarity of my own story. I enter the wide high hall of the courts, somehow designed to make us feel smaller. My bags and I are scanned, and I am in a foyer, with a TV screen listing the names of the people to be called for the court. My name is there. I must find the legal aid solicitor before I am called. I am lucky. My statement has been written, my biography and my website copied, and a reference written for me. Geoffrey, back in Brisbane, has also given advice on what and how to present. I arrive prepared and supported by a group of well-informed people. I feel it is a very different situation for the Aboriginal people around me who mill out of place in the foreign confines of a structure designed far, far away. The duty solicitor is behind a desk piled high with people’s needs and he advises me to wait. We hover outside his door. Time ticks by with monotonous haste to the moment of being called. I feel vulnerable and dangerously invisible despite my heaven-sent support. When we are at last called into his office the solicitor tells us the police papers are not ready. He doesn’t know the charges. A defence cannot be made until he knows. I thrust out my paperwork for him to read before the veil of overburden is pulled down again between us, and he disappears to discuss the matter with the prosecution. The solicitor returns to say it appears the prosecution think there is no case. He decides he wants to get the bail condition removed and the charges of “Hindering a Policeman” dropped. We sit in the sharp, clean silence of the court, shuffling loosely along to let others join us at our bench, as if at some church pew. Indeed – we are here to be judged. And we appear crumpled in all the smartness. Names are called. Formalities followed. The smell in here is of polished pine and blue cloth but the air is uneasy. There are two sides to the fence; those who sit limply waiting to be called, and those who march through procedure. My name is called. It must only be a matter of seconds and I am dismissed, forgotten, eyes turned to the next. The police do not have their paperwork and I am discharged from bail. I am expected to gratefully depart. An invisible cloak falls over the seven hours already spent in gaol. It remains that I may be summonsed at any time over the next 6 months. I am also advised by the solicitor that if the police decide to increase the charge, I might be summonsed at any time, even after the 6 months period. I am told there is only a one-month period, however, in which I can lodge a complaint. I leave the court feeling dazed. My support team guide me across the road and we sit over coffee together. Have the police effectively made complaint impossible? I am certainly advised against it by everyone around me. The journalist agrees it would not be in my interest to write up the story. I am to lie low. I am in Australia. I have been locked up for seven hours for asking after the welfare of my friend. 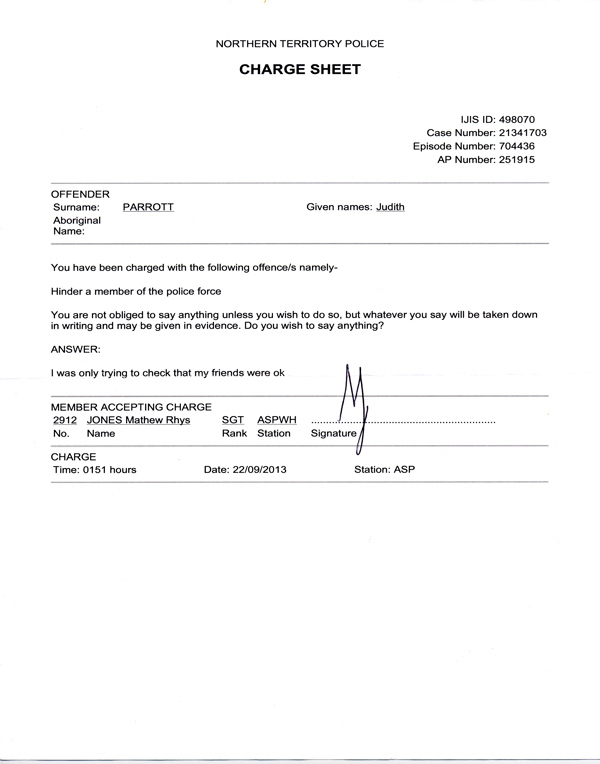 Even the police, when I asked them at the gaol, did not manage to say they would not do the same in my situation. I have not complained. I am however doing as I said I would do. The Northern Territory Police are included internationally in the Grounded exhibition, and on my blog. I thank them once again for this opportunity. 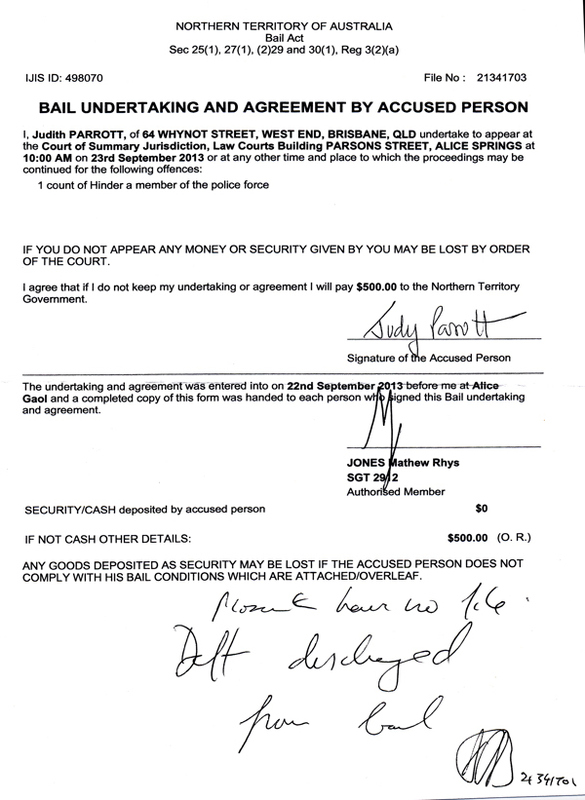 They have provided material to raise a debate on whether perhaps the Aboriginal people of Alice Springs are being locked up without justification, and on how appropriate the systems are. I have started these posts from Australia with the last days of the Grounded artist residency. Tomorrow I’ll return to the beginning of the story and introduce you to the beautiful Australian Aboriginal people I met along the way, and the stories they are very willing to share. This entry was posted in Art, Australia, Australian Aboriginal, human rights, Photography, social justice and tagged Alice Springs, amnesty international, art, human rights, photography by Judith Parrott. Bookmark the permalink. As we said today Judy, even though the police were acting legally, within the law as it stands, all this, your arrest and the arrest of your friend who was trying to help, was really over the top – the actions of officials who have somehow walled themselves off from the humanity of the people they work among. This must have been an extremely alarming experience for you even with the support you had eventually and, as you said, how much worse it must be for so many of the Aboriginal people who don’t have any support at all. Here’s hoping that “Grounded” helps to make the invisible visible. . . Thank you Ann for your comment. Yes – much of the problem lies with the policies that the police are working under. The policies leave police powers very open to abuse. The problem comes i guess when police stop acting within the reasonable limits of their powers and, even more so, if nothing is done to redress that when it happens, and there is no safe method of complaint and accountability. They have a difficult job, undoubtedly, but I guess doing that job well is all part of being professional. I agree that the invisibility is one of the major issues that lets things get out of hand – hence all my posts! Thank you for your support.